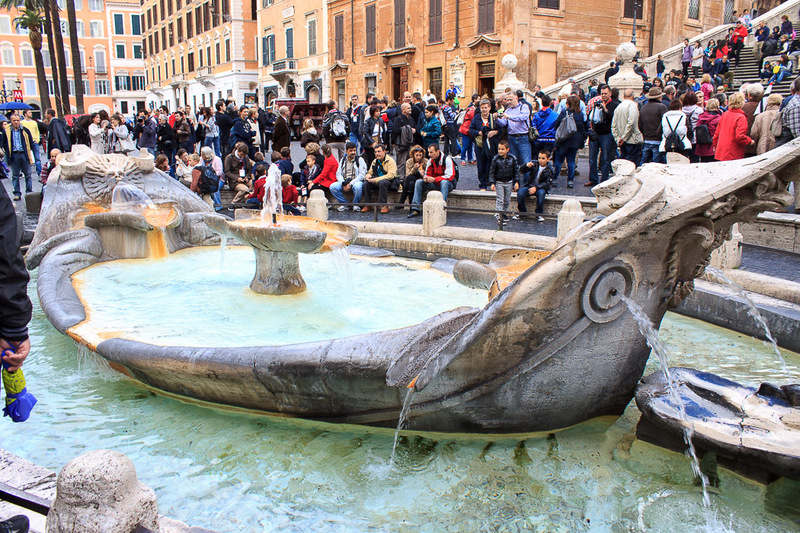 The Sinking Boat Fountain is a baroque fountain at the bottom of the Spanish Steps, just a short walk from the Spagna metro stop. It's shaped like boat and appears to be half-sunken into the sidewalk and into the pool below sidewalk level in which it sits (especially evident in the 1st photo below), with water overflowing its edges and leaking out of several holes in the side of the travertine boat. A silly little pedestal fountain in the middle of the boat supplies the water into the boat, and a bench on the Spanish Steps side of the fountain provides a comfortable place to rest while studying the fountain, if you are lucky enough to find an empty spot on it. The fountain was commissioned by Pope Urban VIII and was completed in 1627 by Pietro Bernini and his son Gian Lorenzo Bernini. Actually, the very low height of the fountain was a solution by Bernini to a problem of low water pressure in the area. 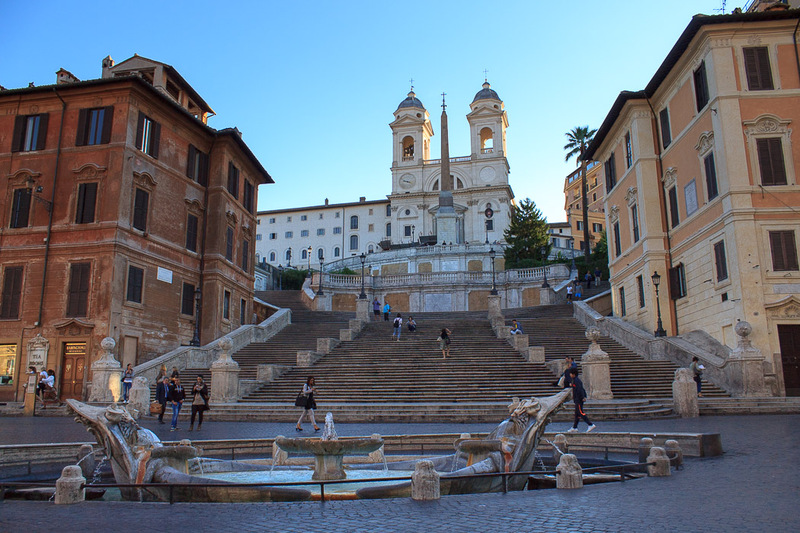 The sinking-boat theme of the fountain was chosen because, prior to the river walls being built, the Tiber River often flooded, and in 1598 there was a particularly bad flooding, and the Piazza di Spagna was flooded up to a meter. Once the water withdrew, a fishing boat was left behind in the square, right where the fountain was later built. True? I don't know, but it's yet another of the legends that today's Rome is built upon, so I'll go with "Heck yeah"! See all Sinking Boat Fountain photos.